In 1989 a black-and-white comic by Richard McGuire, modestly titled "Here," appeared in RAW magazine. It was quickly recognized as a game-changing achievement in graphic narrative. To mark the fall 2014 publication of Here as an all-new, full-color graphic novel and e-book, this exhibition explores the (re)invention of a contemporary classic. In Here location remains fixed in one corner of a living room, but time is boundless and elastic. Populating the space with multiple frames of action dating from the ancient past to the distant future, McGuire conjures narratives, dialogues, and streams of association that unite moments divided by years and centuries. The exhibition combines original drawings for the strip and the novel with source photographs, books that influenced the form and content of McGuire's invention, and collages and sketchbooks that afford glimpses into his creative process. 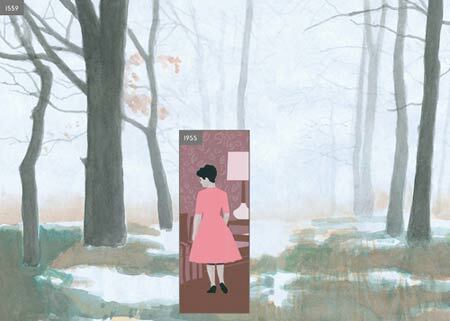 Richard McGuire (b. 1957) is a creator of children's books, music (as a founding member of the band Liquid Liquid), toys, and animated films. He is a contributor to, among other publications, the New Yorker, McSweeney's, and the New York Times. This exhibition is a collaboration between the Morgan Library & Museum and the Dorothy and Lewis B. Cullman Center for Scholars and Writers at the New York Public Library. It is made possible through the support of the J. W. Kieckhefer Foundation.